This isn’t your father’s Superman. This isn’t your older brother’s Superman. Frankly, we’re not quite sure whose Superman this is. After the undeniable success of his Batman reimagining, DC studio Warner Bros. clearly believed that Christopher Nolan was the man to bring America’s original superhero back from entertainment exile (then again, didn’t they think the same thing about Bryan Singer circa Superman Returns?). As Marvel continues to dominate the genre and pop culture zeitgeist, the epic adventures of Kal-El and his trials as part of our planet have become secondary, silly, and old fashioned. So Nolan was hired to produce, and he brought on his own hand-picked people to begin the Herculean reinvention. Man of Steel strives to change our Superman perspective, and it does so in a way so radical, so completely dismissive of all that came before, that it’s hard to call it a success. Instead, Mr. Dark Knight, along with Batman Begins scribe David S. Goyer and Watchman/300 director Zack Snyder, have together collaborated to pitch most of the mythos, ignore the ’40s cartoons and serials, ’50s TV series, ’70s/’80s movies, and post-millennial revamp to focus almost exclusively on the “alien on an alien world” angle. The first 45 minutes take place on Superman’s home planet of Krypton. 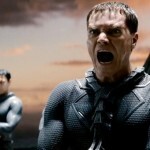 The last hour sees our hero battle General Zod (a decent Michael Shannon) across a crumbling Metropolis landscape. In between, we get memories of a young Clark Kent, Lois Lane (Amy Adams) doing her investigative reporter thing, and the kind of ominous foreshadowing that worked for Bruce Wayne, but may have no place for a noble, extraterrestrial champion. Right up front, we learn why Krypton is dying. Against the wishes of their lead scientist Jor-El (Russell Crowe), the elders have mined the planet to death, and with its imminent destruction comes the desire to save its first natural birth in centuries. As Zod attempts a coup (and is exiled to a black hole for it), baby Kal-El is sent to Earth and is quickly adopted by the Kents (Kevin Costner and Diane Lane). Fast-forward 33 years and we see a mysterious man (Henry Cavill, also decent in the role) working a trawler, saving the crew of a burning oil rig, and wandering from town to town. 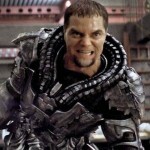 In the meantime, Zod and his crew escapes, Kal/Clark’s powers are revealed, and the U.S. government goes bugnuts over it. Everything is therefore set for a last act confrontation to save humanity. Sounds good, right? Or at the very least, sounds solid and ripe for summer movie season dominance. Indeed, Man of Steel is another in a long line of popcorn entertainment tentpoles with its eye clearly aimed at the overseas market. Michael Bay and Roland Emmerich might think they are the masters of disaster, but Snyder trumps them both in the wanton destruction department. When our lead battles his enemies, he does so into and through mountains, skyscrapers, and any other massive structure that can be demolished in a CG spray of rubble and dust. Fisticuffs take place on the ground, in the air, and in between massive gravity-altering machines. No action scene is small here, no moment when Superman’s powers must be spared the cash-creating “wow” factor. Yet it’s hard to say if all this sturm und drang add up to a success. Man of Steel is entertaining, often engaging, and frequently exhilarating, but it never digs deeper than its basic ideas. Unlike The Dark Knight trilogy, which took a caped crusader and thrust him into the bowels of a believable crime story, there is a weird dichotomy here which causes moments of concern. Maybe these anxieties can be fixed in the sure-to-be-set sequel. Until then, this is the Superman we’re stuck with. While he more or less lives up to his moniker, his introductory movie is less so. It’s good. It needed to be great. You should contact rottentomatoes, unless I am reading you review the wrong way you didn’t mean to say that the movie was rotten, but actually good, not great, but good. If I am wrong please reply – English is not my first language.